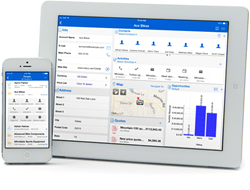 Resco's mobile client for Microsoft Dynamics CRM gets a new look and feel. I am very excited to see how people react to the re-designed app. Resco releases today the Autumn update of its mobile CRM solution for Dynamics CRM. This update includes a number of new capabilities as well as the new user interface of the application. “This update is a huge milestone for Resco Mobile CRM. The list of new enhancements goes on and on – I hope our customers and partners will soon put them to good use. But mostly I am very excited to see how people react to the re-designed app.” Radomir Vozar, CEO at Resco, commented on the new release. As usual, the new update comes free of charge to all existing customers and partners of Resco. There are no additional fees for the new version of the app as well. As of this release, the iOS (iPhone, iPad) and Windows desktop applications support the new re-designed app. The Android and Windows RT versions will follow in the upcoming Winterˈ14 Update. Resco, founded in 1999, is one of the global leaders in developing cross-platform mobile software solutions and the creator of the market favorite Mobile CRM client for Dynamics CRM. The app – which gives users around-the-clock access to their CRM data from anywhere – comes with a full offline mode, interactive maps, support of custom entities & many other attributes that make it the product people love to use.